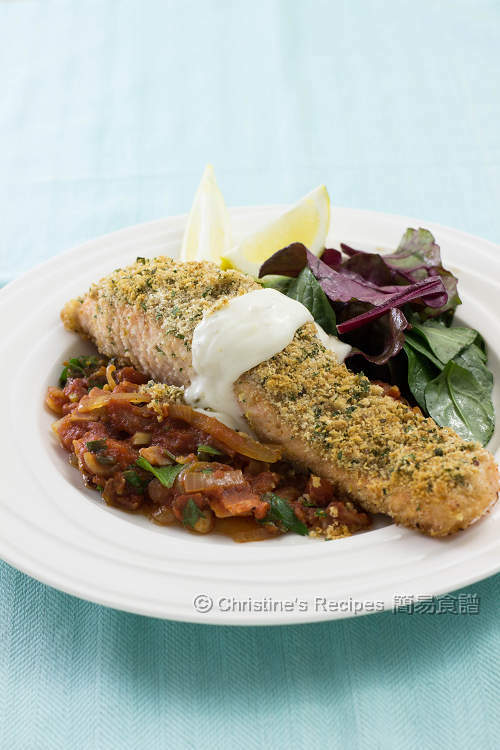 This baked salmon with herb crust is served with a very delicious sauce, perfect paired with salad or noodles. Do you like eating salmon? Not only salmon tastes good, but also provides us with many unique health beneficial substances, like Omega-3 fatty acid that help improve our memory. 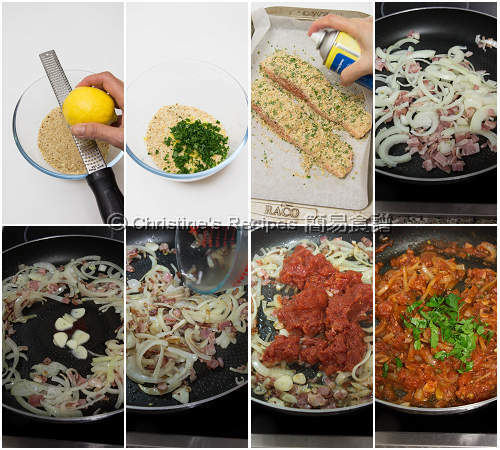 Speaking about cooking, it’s very easy and quick to cook salmon. You can eat it raw, pan fry it, boil it, steam it or bake it. This time I baked salmon coated with a layer of herb crust. Thus the fish fillet won’t be dried up easily in an oven. The salmon fillet will keep its moist. 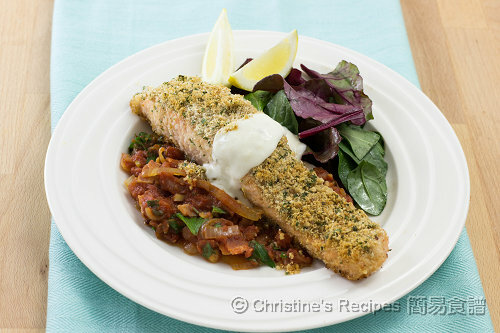 A very tasty sauce is served with the salmon, taking the whole dish up a notch. Preheat oven to 220C / 430F. Season both sides of salmon with salt and pepper. Coat with breadcrumbs, lemon zest and 1/3 of chopped parsley. Lightly press the surface. Spray a little oil on top. Bake in the preheated oven for about 15 minutes. Meanwhile, prepare the sauce: Heat a pan and sauté bacon over medium-high heat for 3 minutes. Once bacon releases its oil, add onion. Fry until softened. Saute garlic in the middle of the pan. Pour in wine and cook for 1 minute. Pour in diced tomatoes. Bring it to boil. Stir in baby capers, ketchup and the remaining parsley. Stir to combine. Season with salt and pepper. Serve with yoghurt and your favourite salad. Either salmon with or without skin is good for making this dish. Baby capers are added to enhance flavours, available at supermarkets. The amount of breadcrumbs can be adjusted to coat all sides of salmon. My favourite fish with fresh herb crust...simply wonderful! I have to give this recipe a try.